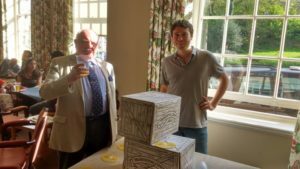 On 7 May 2016, Pembury Real Cider launched their 2015 “vintage” cider at the Tunbridge Wells Bridge Club. This vintage is very similar to the 2014 vintage and this shows the skill of Lucjan in blending the six different varieties of apples to make the medium dry cider. Cider connoisseurs will know that cider is made by fermenting the freshly pressed apple juice in the Autumn. The fermentation generally takes about three to six months before it is ready to drink. As the composition of the apples will vary from year to year, so will the taste of the cider. Lucjan ferments each variety of apple separately and then blends them to make his cider. This was held on four days from 19 to 22 May in Tonbridge Old Fire Station. 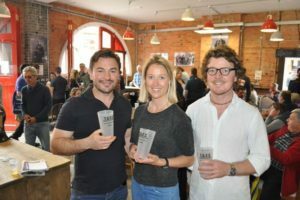 The ciders were a mixture of Eastern Counties ciders from Kent and Sussex and the West Country style of cider from Devon, Herefordshire and Wales. There probably were up to 30 different ciders offered over the four days. The event was well attended and it is proposed to hold another Festival in the future. 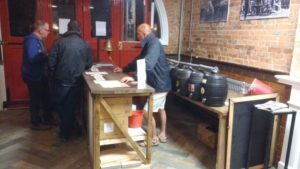 On 25 May 2016, The Pantiles Tap was presented with the inaugural West Kent CAMRA Cider Pub of the Year award. 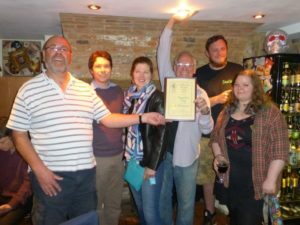 Several CAMRA members as well as local cider makers attended the presentation. On the evening of the presentation they had an amazing 21 different ciders for sale. 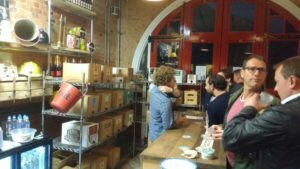 There was also cider tastings from Hurstwood Cider in Sussex.